J'espère que ça marche bien? I am travelling to Paris with my 4x children to visit Disneyland Paris and I was planning to take the train (RER A) from Torcy train station to Marne-la-Vallee - Chessy. 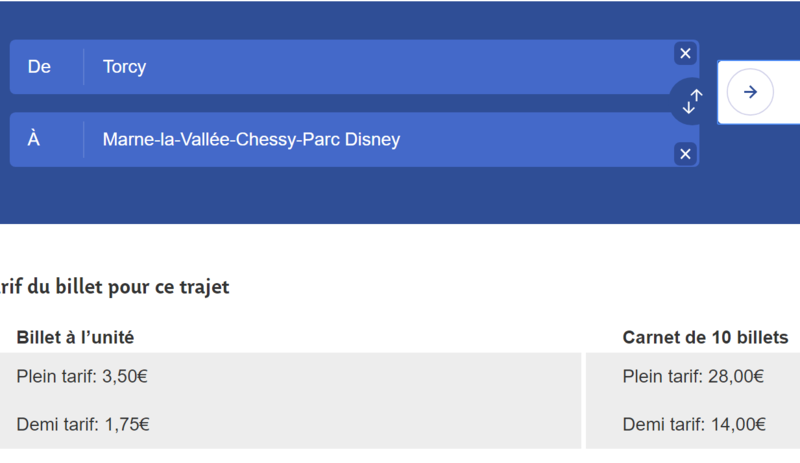 What is the best and cheapest ticket option for me to travel the 3x stations within Zone 5 between Torcy station and DLP and back on 3x days and pls also advise if the tickets can be bought no problem at Torcy train station or if i have to pre-order / can pre-buy them somewhere? Thanking you so much in advance and looking forward to hearing back from you soon. Buying booklets ("carnet") of 10 RER tickets between Torcy & Marne la Vallée is likely the cheapest option for you. Booklets of tickets come at a ~20% discount vs. buying individual tickets. Full adult price booklets would be 28€ and children discounted booklets 14€. Each ticket can be used for either going to and returning from Disneyland. The booklets can be split among the children. For 3 days & 4 children, 2-one way trips each, that would be 24 tickets, so 2 booklets plus four extra tickets. For yourself you could purchase either 6 individual tickets or buy a booklet and have some extra tickets left over. If your children are 9 and under you can use half-price tickets ("demi-tarif").